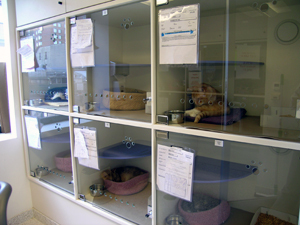 Dr. Julie Levy, program director and professor of Shelter Medicine, examines cat housing and enrichment during an assessment. Through shelter consultation, our program’s veterinarians are available to help animal shelters meet their lifesaving goals while providing the best possible care for the animals. Faculty, advanced trainees, and staff are here to help shelters be their best. If your agency is interested in shelter heath assessment services from Maddie’s® Shelter Medicine Program, please complete and submit the Request a Shelter Health Assessment form. A representative of Maddie’s Shelter Medicine Program will contact you to discuss your request in more detail. Learn more or request an assessment. If a thorough assessment is what your agency needs, a full shelter health evaluation encompassing a wide range of sheltering topics can be performed through an on-site assessment. Whether responding to community criticism or working to become a model agency through best policies and practices, we have worked with shelters of all shapes and sizes. Whether a shelter is struggling with the basics or ready to take programs to the next level, we work to find ways to help shelter leadership meet their goals and improve shelter animal health and well being. 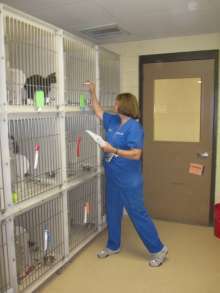 And just as a physical examination of a pet includes an evaluation of all body systems while considering the goals and abilities of the owner, a complete shelter health assessment includes a hands-on look at shelter operations with consideration for the shelter’s mission and specific assessment goals.